If clams are not what you had in mind, then try this scrumptious Mussels Arreganata or Orreganata. 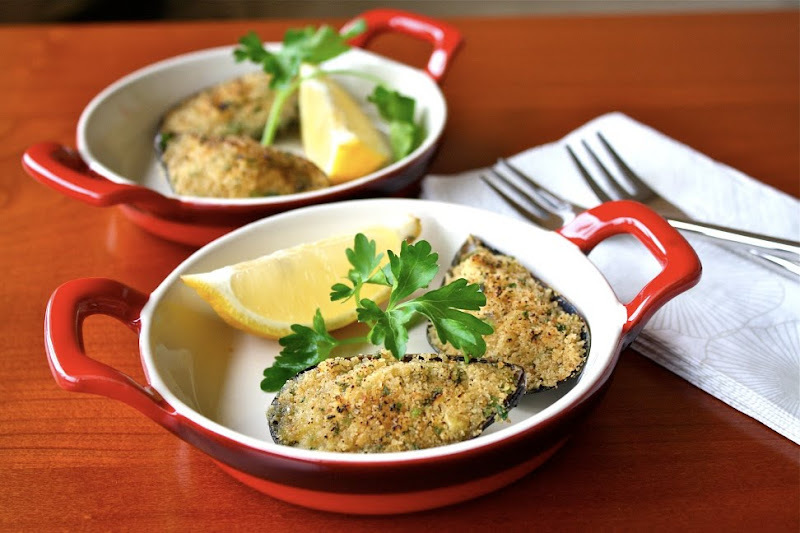 The mussels are topped with seasoned breadcrumbs and then broiled in the oven. Simply divine! Place the mussels in a large saucepan and add cold water to cover. Bring to a boil and cook over high heat for 10 minutes, or until mussels open. Discard those that have not opened. Transfer the mussels to a colander and rinse under cold water until they are cool enough to handle. Shuck the mussels, discard half the shells, and place the mussel meat in the remaining half shells. Season with pepper. 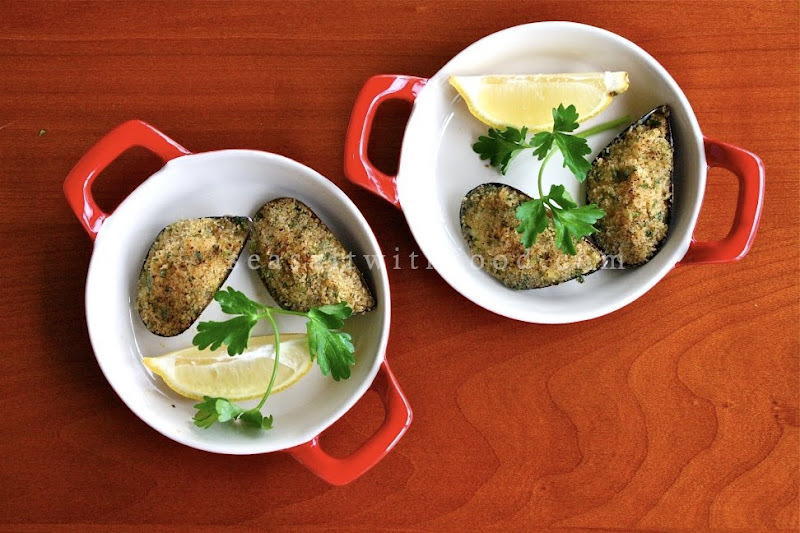 Spoon the breadcrumbs on the mussels and smooth with the back of a spoon. Arrange the mussels in one layer in a broiler pan, and drizzle lightly with olive oil to moisten. Broil until the breadcrumbs are lightly browned, about 2 to 3 minutes. Remove and serve hot with lemon wedges. 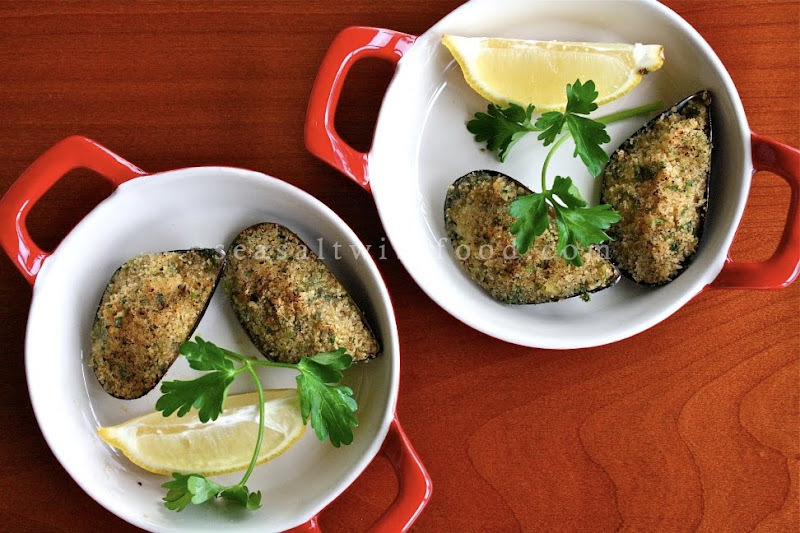 Note: Seasoned Breadcrumbs – ½ small Italian Stale baguette (about ½ lb), 2 Tbsp Freshly Grated Parmigiano-Reggiano, ¼ cup minced flat-leaf Parsley, pinch of oregano, 1 garlic clove (minced), 3 Tbsp Olive Oil, sea salt and freshly ground black pepper. Break the bread into large chunks and place in a food processor. Process until reduced to fine crumbs. Transfer the crumbs to a large bowl. Stir in the cheese, parsley, oregano, and garlic. Gradually add the oil, stirring, until thoroughly combined. Season to taste with salt and pepper. Oh I love this recipe!!! Will definitely try it!